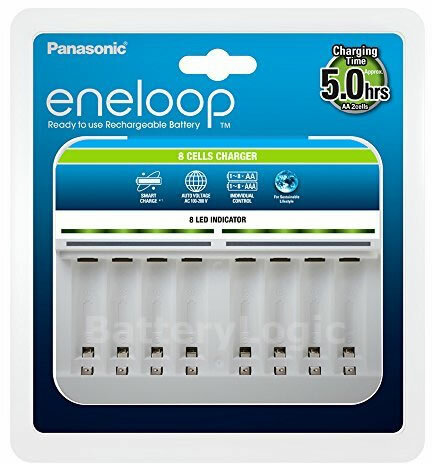 The Panasonic BQ-CC63 is a sophisticated yet very easy to use intelligent battery charger that will reliably charge up to 8 AA and AAA NiMH rechargeable batteries in any combination at any time. The BQ-CC63 is gentle on your batteries and therefore the perfect battery charger for use with any good quality AA or AAA rechargeable battery brand. The cleverly designed BQ-CC63 battery charger is independent on a per battery basis and looks after the charge status of each battery individually. What this means is that you can independently charge 1, 2, 3, 4, 5, 6, 7 or 8 batteries perfectly each and every time. If you are looking for a top quality, no nonsense and thoroughly foolproof charging unit that is very easy to use then the Panasonic BQ-CC63 could be the battery charger for you.